This summer AWC-SB launched a summer book club, Books for Breakfast. Participants expressed interest in reading together beyond the summer. We hope you will join us for a scrumptious breakfast at State & Fig and a discussion of Local Dollars, Local Sense: How to Shift Your Money from Wall Street to Main Street and Achieve Real Prosperity. The book discussion will be facilitated by Marsha Bailey, CEO of Women’s Economic Ventures. The book is on sale at Granada Books. 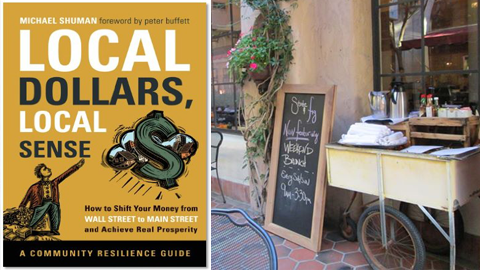 About the book: Local Dollars, Local Sense is a guide to creating Community Resilience. Americans’ long-term savings in stocks, bonds, mutual funds, pension funds, and life insurance funds total about $30 trillion. But not even 1 percent of these savings touch local small business-even though roughly half the jobs and the output in the private economy come from them. So how can people increasingly concerned with the poor returns from Wall Street and the devastating impact of global companies on their communities invest in Main Street? In Local Dollars, Local Sense, local economy pioneer Michael Shuman shows investors, including the nearly 99% who are unaccredited, how to put their money into building local businesses and resilient regional economies-and profit in the process. A revolutionary toolbox for social change, written with compelling personal stories, the book delivers the most thorough overview available of local investment options, explains the obstacles, and profiles investors who have paved the way. Shuman demystifies the growing realm of local investment choices-from institutional lending to investment clubs and networks, local investment funds, community ownership, direct public offerings, local stock exchanges, crowdfunding, and more. He also guides readers through the lucrative opportunities to invest locally in their homes, energy efficiency, and themselves. A rich resource for both investors and the entrepreneurs they want to support, Local Dollars, Local Sense eloquently shows how to truly protect your financial future–and your community’s. This entry was posted in Past Events on August 26, 2013 by Lisa.